That first birthday for your little boy marks a very large milestone. Just one year ago, he was a tiny infant, completely dependent on your care and protection. Now, at one-year-old, he is starting to become an independent toddler. At this age, he will have just started standing and possibly even walking. He will also be starting to repeat sounds and full words. Even if your child has not developed either of those skills, now is a great time to start teaching him basic skills, words, and educational information. What better way to help him develop all these new and important skills than incorporating them into everyday play! Here are 25 great toys for your little boy as he starts these important developmental stages so that he can be both entertained, mentally stimulated, and physically active. 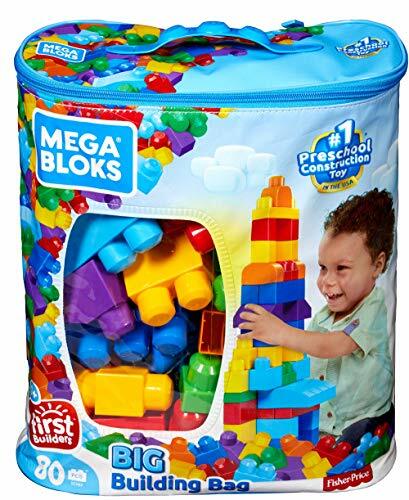 The Mega Bloks 80-Piece Big Building Bag is a collection of different sizes and shapes of blocks that can be creatively stacked. These are the First Builder collection from Mega Bloks. After this collection comes five additional stages of Mega Bloks that are specifically designed for your child’s age and abilities, each with the goal to help stimulate and strengthen your child’s body and mind through instructional play. The First Builder blocks are for one-year-olds. The blocks are designed to interconnect for an enhanced building ability. By connecting the blocks, your child is not just limited to simply stacking the blocks. The blocks are also offered in different sizes and shapes so your child can make an animal, a car, or a tower, the options are as endless as your child’s imagination! All packs of these blocks come in their own portable PVC-free zip bag for storage or transportation. These blocks are offered in four different styles and colors. The Classic style features basic blocks in the primary colors. A trendy package can be used as an addition to the classic package or on its own. It features a few additional shapes of blocks for even more creative building options. A pink pack is available for any toddler that would prefer more pastels and pinks in their building. A special educational pack includes numbers on some of the blocks in order to help with mathematical skills while enjoying a fun playtime. Providing your one-year-old son with building blocks has many advantages. At this point in your child’s life, they will really be starting to develop their motor skills. Having to balance and connect blocks while also considering gravity takes skills. Building blocks will help with their development of these balancing and reasoning skills. Mega Bloks helps with this skill additionally by creating their First Builders the perfect size to fit in your growing son’s small hands. Building with blocks will not only help them physically, but also mentally. Their creativity will be awakened as they come up with ideas in their mind and try to reason how they can create those same images and structures using a scattered number of blocks. Their reasoning skills will also need to be used. As mentioned before, they will need to think like a basic engineer to discover how best to balance the blocks in order that they remain standing even when additional blocks are added. Building blocks are also a great educational tool. Mega Bloks comes in many different colors which will help develop your child’s vocabulary and color recognition as they use color words to communicate when playing with the blocks. They will also begin to learn basic math concepts such as adding one block, or taking two away to achieve the desired number. Playing with your child can provide the perfect opportunity to take this a step further and turn tower building into fun basic math lessons. The Mega Bloks educational set can even help further with their printed numbers on the blocks. Lastly, blocks are a great toy for social interaction. There are thousands of toy options available, but many of them are to keep your child entertained on their own. Blocks are a toy that can be played with friends. This will help develop your child’s first social skills as he learns teamwork from building a structure together, sharing, and communicating with his peers to express his feelings and needs. Blocks are very versatile and can last for years. The blocks have educational value. The blocks will help with your son’s development. They are a more affordable toy. There are not many breakable parts. The blocks may not be instant entertainment and will take some learning at first. They are not as easy to bring along on trips. They make more of a mess to clean up. 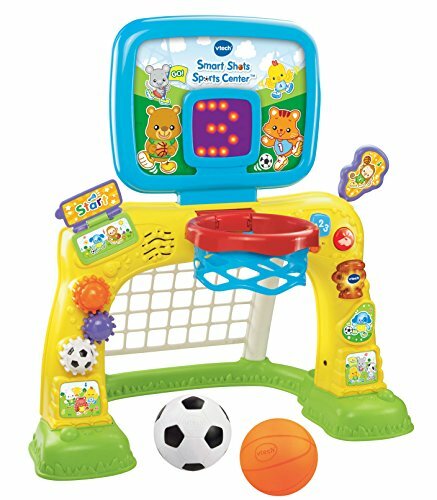 The VTech Smart Shots Sports Center is a great way to bring out your son’s inner athlete. Your child will be challenged and develop better motor skills all while having fun and playing basketball and soccer. The sports center is a small soccer goal and basketball hoop combo. It is battery operated, using three AA batteries, which allows the toy to light up and make sounds. It also has the ability to keep score up to ten scores. A small basketball and soccer ball are included with the sports center. The sports center is built for toddlers ages 1 through 3-years-old. At one-year-old, your son may have just started to wobble around. He will have plenty of energy and want to be constantly on the move with his newfound mobility. The sports center will help channel that new freedom and energy while keeping your child in one area. He will have the opportunity to practice his balance as he stands to throw the basketball. He can also work on his hand-eye coordination by aiming. He will have even more balance practice by trying to kick the soccer ball into the goal. In addition, the scorekeeper will help challenge your child’s math skills as they soon learn to count their own goals and scores. The sports center helps with teaching your child other educational skills outside of just sports. There are over fifty songs, sounds, and phrases that the sports center is able to say. These can help with your child’s language ability. The different shapes and colors on the sports center will help teach your child basic shapes and colors. This sports center can help develop an early love of sports in your son. According to the Better Health Channel, sports have many benefits for children. Sports help keep children active. By being active, children reduce their risk of obesity and all the health concerns along with that. While your toddler is too young to join a sports team, they are not too young to learn a healthy, active lifestyle. They can also start learning about sports in order to encourage a love that could lead them to join a team when they are older. Being involved in sports is also healthy for your child’s heart. A good cardiovascular exercise can help reduce health issues as your child ages. It also helps promote healthy growth in their bones and muscles. They will start sleeping better, eating better, and all around have a better mood. Sports also offer a great way for your child to develop close social interactions. Your child will have the opportunity to interact with their peers on a regular basis to develop friendships. Learning teamwork through a sport will also help enhance positive habits in their friendships such as working with others and using good communication. You do not want to wait until your child starts to struggle with obesity or develops health issues to start integrating your child in sports. You can start at a young age by incorporating different sports in their playtime so that when they are older, they already know and love sports and may even already have a favorite sport that they will ask to get involved with. Helps prepare your child for a healthier, more active childhood. Improves your child’s hand-eye coordination and balance. Helps your child learn basic math skills. May require too many motor skills for younger boys. The sports center is not easy to travel with. 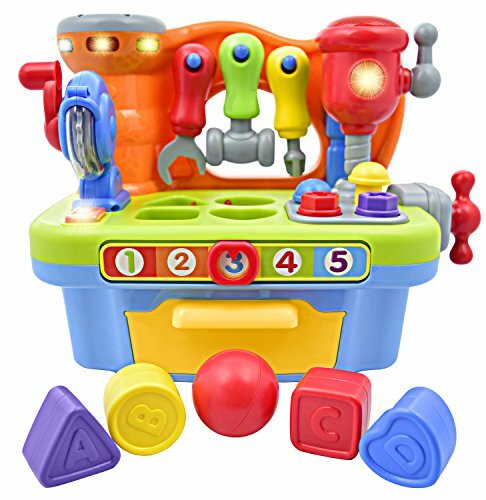 The Deluxe Toy Workshop Playset for Kids with Interactive Sounds and Lights is your son’s first tool bench. It is a fun mix of colors, toys, and educational elements all in a compact design. The toy’s design theme is a game workshop and features multiple different game options depending on your child’s age and ability. The main element of the toy set is a toolset. The set features a bench as well as four different tools. The tools include a hammer, wrench, screwdriver, and crank saw. A set of four screws and nails provide an interactive experience for your child. They will learn to screw, wrench, and hammer the different screws and nails. This will help develop their reasoning skills as well as basic motor skills for handling each tool. The tool bench takes batteries. The batteries power some fun lights and sounds. The sounds correspond to each of the tools. In addition to the tool sounds, the tool bench also has a variety of musical tunes. The music will help hold your child’s attention while they play. A secondary game with the tool bench is its shape blocks. The tool bench’s top is flat with four shape holes. Four different colored shapes correspond with the holes. In addition, the shapes also have the first four letters of the alphabet. This helps teach your child shapes, colors, and letters. To help with this learning experience, when a shape is dropped through the correct hole, the toy will say the name of the shape. A front door allows your child to easily retrieve all the shapes again. The front of the tool bench has a number line. A slider can be moved from number to number which results in the toy saying each number. There is also a small ball that can be thrown into a small cup area to practice your child’s aim. All sounds and music have three options: quiet, loud, and mute. There are plenty of activities to keep your child occupied. There is a good variety of educational and physical activities. The toy helps expand your child’s vocabulary. It is small enough to travel with. Some of the activities may not be for some younger boys. There are a lot of smaller parts and moving parts that can be broken or lost easily. 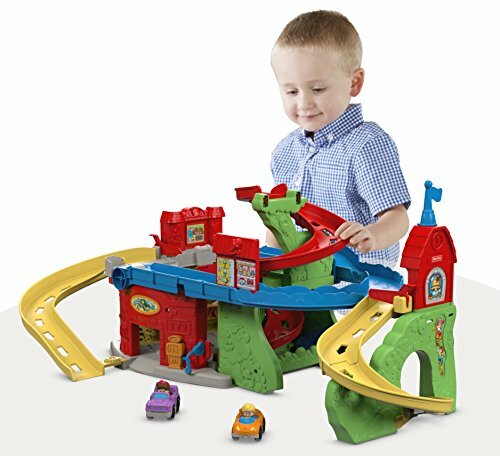 The Fisher-Price Little People Sit ‘n Stand Skyway is a simple way to keep your little car-love entertained for hours. This easy track is more than just a roadway. It is an entire mini-city. The track is one solid piece. This will help keep you from losing tiny road pieces or having to reassemble the roadway between uses. There are two settings for this track. With one lever, the track folds from a flat city to a tall racing mountain. The set comes with the road and two vehicles. Additional vehicles can be purchased separately, or your son can use his own car collection as the road is very large and can accommodate most vehicles. The city includes many fun little activities for your son’s cars to participate in. There is a gas station with a removable gas pump that can pump up your child’s cars. There is also an ice cream shop and toy shop for your little driver to stop by while driving about. A garage is provided for those little repairs your child wants to make. There is also a toll road with a barrier gate that your child can manually lift to allow their vehicles to pass through. The track has two different set-up options both with their own benefits. The flat design will allow your son to lie on the floor and drive his vehicle about. This set up will be good for when your child just turns one-year-old and may not be able to stand on his own yet. He can still enjoy the small activities around the track. The standing option is good for your little racers. Your little one will get practice standing on his own and having good stability as he stands up to play with the track. He can then place his cars at the top of the tower and watch them race down to the bottom. When standing, the raceway measures 34 inches tall. The roadway is great entertainment for all ages. It can be used up until the recommended age of 5-years-old. There are no batteries required and no annoying sounds to deal with. This can help prolong the life of the raceway. The raceway helps promote your child’s motor skills as they learn to drive the car along the roadway. They can also practice their colors as they view the different colors of ramps all along the roadway. You can even use the roadway as a great opportunity to teach your child new car-related vocabulary words. The roadway is one piece so no assembly is required between uses. There are two options for using the roadway to help keep it new and exciting. This toy does not take any batteries. It is sturdy and can last for years. Only two cars come in the set. There are not many educational parts to the toy. It is difficult to store due to its size, as well as travel with. 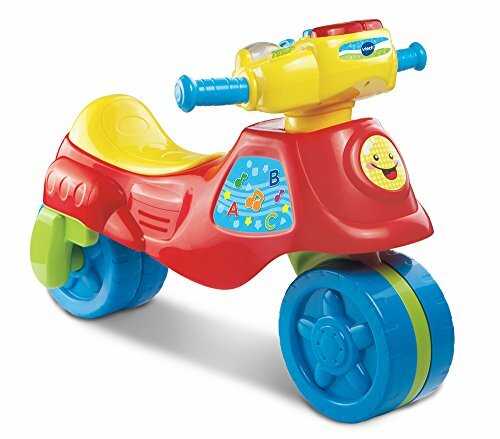 The VTech 2-in-1 Learn and Zoom Motor Bike is an interactive toy that can help your little son become more mobile. It is a great way to both encourage your child to practice walking as well as teach them basic vocabulary. The bike is battery powered, requiring two AA batteries. It can still function as a basic bike even without the batteries. The bike is made for children ages 1 through 3-years-old. The bike has two setups. It can begin as a tricycle for your younger cyclists. If your little one-year-old is still unsure on his feet, the tricycle will provide extra balance so that your son can focus on the movements of his feet to push off and make the bike move forward. As your child becomes surer on their feet, the two back wheels can fold together as one single, central back wheel so your child can ride the bike more as a motorcycle. The bike can easily be controlled by your little one. There is a steering wheel with two small handles for your child to grip while he rides the bike. As he drives, the bike emits fun music as well as motorcycle sounds to provide a more authentic feel to the bike. The bike has a motion sensor to help know when to emit which sounds. Your child can also use the bike as an educational tool. The dashboard of the bike is full of fun lights and levers for an interactive educational experience. There are a group of buttons that help teach your child colors and shapes through sounds and music. Other buttons are levers and rollers that help develop your child’s fine motor skills. The bike even helps teach your child basic road safety such as through the bike’s turn signals and a speedometer. In total, the bike has over 70 sounds, songs, and phrases. The bike develops both fine and gross motor skills. It will keep your child more active during play time. There are plenty of activities to keep your child entertained. The bike will teach your child shapes, colors, and other basic vocabulary skills. This is not a social toy and can only be played with by one child at a time. It is not very portable for travel. Your child will be taking regular baths from nearly the first day after birth, there is no reason why you shouldn’t make bath time also playtime. The Nuby Octopus Hoopla bath time toy is a great way to keep your child entertained during their bath. It could also be used when playing outside in a pool during the summer. While it is intended as a water toy, if your child is creative, the octopus toy could also function as a regular toy for entertainment throughout the day. The octopus is a colorful and exciting ring toss game for toddlers. The toy is meant for ages 18 months and older. It is completely BPA free. The toy includes one large, purple octopus with six tentacles. The tentacles are curled up as hooks. The toy also includes three rings. These rings come in a variety of shapes from a stripped ring, star, and a fun fish. Your child can work on their hand-eye coordination by tossing the rings onto the floating octopus. They can place the octopus on any surface to play ring toss in all environments. The octopus is easy to travel with. There are very few parts to get lost or broken. The octopus can work both in the bath and outside the bath. The toy does not require batteries. The toy only has the one game, which may not entertain for long periods of time. Some younger boys may have trouble with the game. If you wanted a different bath time game, Fajiabao has created a fun fishing game for toddlers. The game includes a fishing rod and three fish. Your child can then practice their motor skills and hand-eye coordination to pick up the fish using the rod. This game is great for both the bathtub or to be used outside when your child is in the pool during those hot summer months. Your child could even use the rod and fish on the carpet. The three fish are all different colors with fun polka dots all down their back. They are made without any sharp edges that could hurt your little one. They are also completely sealed so water will not enter into the fish, which can in turn cause bacteria and mold growth. 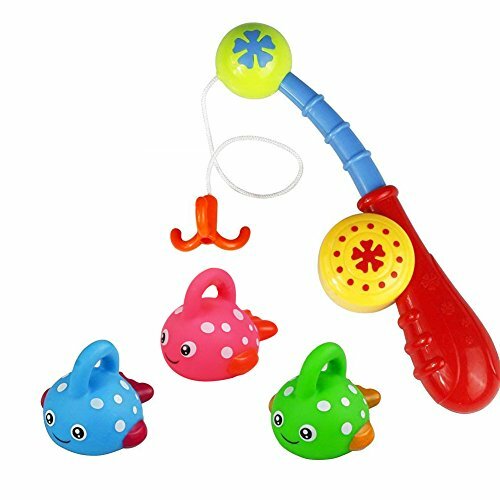 The fish do float which creates a fun challenge for your little one. The fishing rod has an easy and comfortable handle to grip. A large hook can easily latch through the fish’s top hook, allowing your child to catch the fish. Your child can practice their hand-eye coordination. No batteries are required for this toy. It can be used in the pool and bathtub. Some younger boys may not be able to use the fishing rod. Only one child can use the toy at a time. 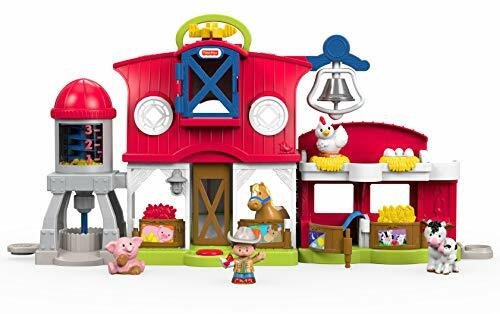 The Fisher-Price Little People Caring for Animals Farm Set is a fun way that your son and all his friends can interact in hours of creative play. This set includes a medium-sized interactive farm with five play figures. It also has some removable fodder. The set helps develop your child’s creativity as well as expand their vocabulary as they learn how to care for animals. The entire farm set can easily be carried by the top carry handle for transporting it from place to place. The farm is more than just a roof over the animal’s head. The set allows your child to interact and care for the animals properly. The part has multiple swinging doors for your child’s animals to enter and exit through. A farm bell allows your child to call the animals home. A silo on the side of the barn holds corn. Your child can twist the top of the silo to hear the corn pop and watch the corn fly around. The hayloft can be opened and items can be dropped through. The farm can become even more interactive if batteries are installed. A discovery button can be pressed by placing animals on top. This button then lets out a myriad of sounds and phrases that help create the farm ambiance. It will also turn on lights and automatically open up the different stall doors for the animals to enter. This toy works well to encourage social interactions. The toy can be played with or without batteries. There are plenty of activities to keep your child entertained for long periods of time. It is easy to transport with you. There are items that use battery power. There are many turning and twisting items that can break easier. 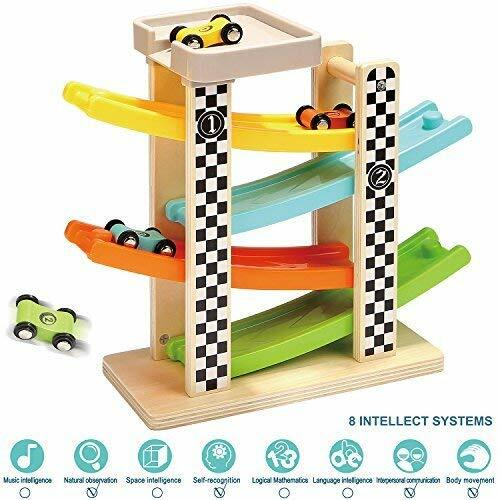 If your little boy loves cars, then this simple, yet fun wooden race track by TOP BRIGHT will be a definite crowd pleaser. There are very few moving parts or bells and whistles on this track. Instead, it goes back to the basics where all you need is a car and a track. It requires no setup and is great for little boys who love to watch cars race down a track. The race track is built out of wood. The track is a tall tower that is five levels high. Small wooden cars can park at the top of the tower. These wooden cars are specially built so that they can drive whichever direction they are flipped. There are four differently colored wooden cars that are toddler safe included with the set. The cars are then pushed off the top ramp and land on the first colored tier where it goes racing down and flips itself on to the second brightly colored tier all the way to the bottom. This toy is great for your child to play on his own or with his friends. There are multiple cars so your son can easily take turns racing his car down the track with a fellow playmate. This will help him develop healthy social skills and learn to share and take turns. He will also learn observational skills as he carefully watches the car fly down the tower. He can also learn basic motor skills by practicing placing the car at the top of the tower to start the race. This is a social toy. There are multiple cars included with the package. There are no moving parts or pieces to get broken easily. The toy is not easy to store or transport as it is one solid piece. The activities are limited and may not keep your child entertained for as long. 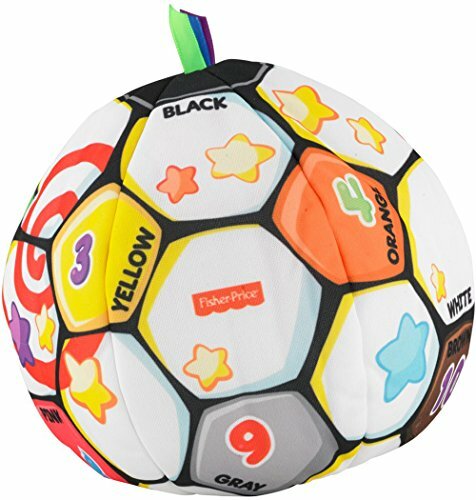 The Fisher-Price Laugh and Learn singing soccer ball is another way to both entertain and educate your child as well as expose them to the gross motor skills required in sports. This fun soccer ball is soft which makes it safe for children from 6 months all the way until 36 months. The ball requires 3 AA batteries to fully function. This singing soccer ball will help get your child learning and moving about. There are three play modes available with the ball: learning, music, and imagination. The soccer ball can be activated through either pressing designated spots, rolling it, shaking it, or throwing it. Some of its hexagons have different colors, numbers, and words to help with the learning experience. A friendly face gives the soccer ball a more inviting feel. Your child can learn their numbers and counting when using the counting feature. He can also learn about colors and opposites. The ball has many fun songs, sounds, and phrases. The ball does have volume control and a mute button. The soccer ball is also designed to help introduce your child to sports. As mentioned earlier when discussing the sports center, sports are very important in children’s health and development. Keeping active helps strengthen your child’s muscles and bones while also helping children learn balance and basic skills. Joining a team helps children develop healthy social habits. This ball is a great way to start teaching these important skills. The ball is a good way to start learning how to throw, roll and kick. The ball also has a list of phrases to teach your child about sportsmanship such as taking turns and sharing. The ball has many educational benefits. It can help your child develop an interest in sports. The ball will help your child remain active. It can be used with multiple children as a social toy. The plush exterior is machine washable, as long as the electronics are removed first. The toy does require batteries. The mechanics inside make the plush a little too hard to be fully considered a plush while the soft exterior makes it too soft to be fully used as a ball. Children may not be entertained as long with the ball. 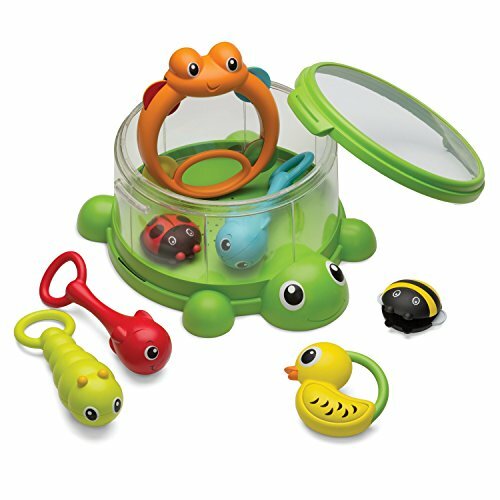 The Infantino Turtle Cover Band 8-Piece Percussion Set is perfect for your little musician-to-be. You can practice beats, singing, and basic music theory with your little son all while having a blast with this fun, colorful set of first instruments. None of these instruments require batteries. There are eight different percussion toys in the set. The theme of the percussion set is animals so each of the instruments is a different colored animal that you may find around a pond. There are seven smaller pond animals, and they are all stored in a large turtle box. This box has a drum lid so that when the other instruments are dumped out, your child can turn into the little drummer boy. The other instruments include a caterpillar and two fish maracas, a duck bell, a lady bug, and a bumble bee castanets, and a frog tambourine. Music is very important in a child’s development, according to Bright Horizons Family Solutions. Music has been recognized to have a particularly calming effect on children even before they are even born. Parents can feel children react in the uterus to sounds and music. Newborns can often times sleep better when music is played. Music is not just healthy for its calming effects. It is also beneficial to the brain. A study done by the University of Southern California in 2016 actually found music to help brains to develop quicker, especially in language and reading. If your child plays an instrument, the theory they learn can help them better understand other areas in their education such as math. This, in turn, can help them with their ACTs and SATs. Music not only helps develop your child mentally but also physically. Music can help keep your child active through dancing and movements to the tunes. It can also help them relax so they have fewer health problems. Music tends to raise children’s emotions and make them feel happier and healthier. A great way to incorporate music for a toddler is to repeat a small number of songs multiple times. This will help your child’s language development as they slowly learn to repeat the words. You can also encourage them to dance along with music which can help instill a recognition of beat and pacing which can help them later in life in music theory. Having instruments can make listening more fun and interactive by having your child participate in the song. Music is very good for your child’s development. Song and dance help keep your child active. There are many instruments which can be used as a social toy. The instruments are easy to transport. None of the instruments require batteries. There is no volume limit, so the toys may be too loud in some circumstances. Most of the instruments make similar sounds. 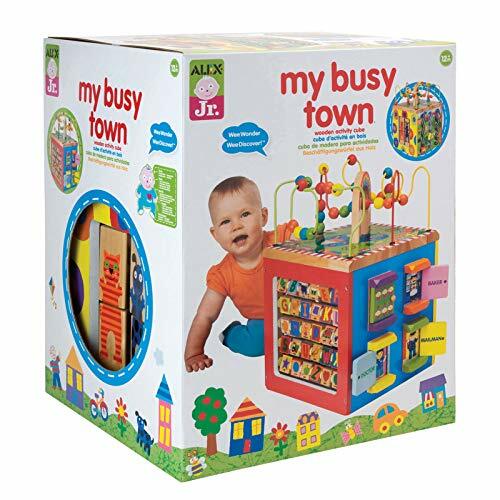 The ALEX Discover My Busy Town Wooden Activity Cube is a great way to keep your child entertained for hours in one location with very little mess. Activity cubes are available from many companies. They all have the same idea. Activity cubes provide the maximum amount of entertainment using the minimum about of space all in one item. Out of all the activity cube options, this is one of the best quality and most educational options available for your little one. The cube is designed for children one year of age and older. It is a perfect height for your little one to sit next to when playing with the sides, or stand when playing with the top activity. This can help keep your child active as they walk or crawl around the cube. 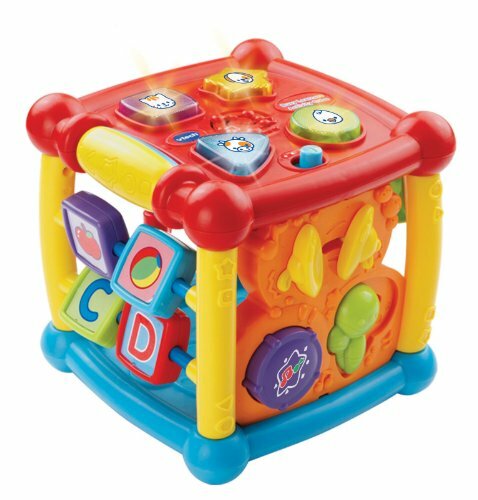 While the cube has many moving parts to keep your child entertained, none of the parts detach completely. You will not have to worry about your child choking on the toy, losing parts, or having to assemble the cube between uses. It is easy entertainment for all occasions. None of the cube’s activities require batteries. It also does not make any noises that could become annoying or limit where the cube can be used. There are five sides on the cube, each with a different activity that helps to educate, entertain, and strengthen your child’s skills. The entire cube measures 16 inches by 12 inches by 12 inches. The top of the cube has a fun array of colorful twisting wires with beads that your child can move from one side to the other. This helps your child develop fine motor skills as they have to maneuver the beads around each curve and twist. There are four additional activities along the side. One side has a racing roller. There are three vertical, winding tracks with a wooden pin sticking out each one. The wooden pins have fun pictures on them. Your child can race their friends as they see who can move their pin from top to bottom or bottom to top the fastest. Another side has a spin and match animal game. This helps your child develop their creativity as they spin the wooden sections of the two animals to create funny and adorable animals. A third side has four peek-a-boo doors. Each door represents a storefront. Your child can then open the door to see an image and title of the person who works in the store such as a baker and a mailman. This helps develop your child’s fine motor skills as well as their vocabulary. The last side is a large spinning alphabet. The alphabet cubes have each letter on one side, and when they are flipped, your child can see a picture of an item starting with that letter. The bottom of the alphabet also has some basic shapes and colors. This is both fun and educational for your child as they develop foundational reading skills. This toy does not require any batteries. There are no parts that can be lost or need assembling. There are enough activities to keep your child entertained for hours. There are plenty of activities to develop all aspects of your child’s mental and physical development. This is a larger toy and is more difficult to store or travel with. There are a lot of moving parts that could be easier to break after a while. The BalanceFrom Kid’s Puzzle Exercise Play Mat with EVA Foam Interlocking Tiles is a multi-purpose item that is both practical and fun for your child. The foam mat measures 72 inches by 72 inches and is made up of 36 separate tiles. Each tile measures 12 inches by 12 inches and is just under a half inch thick. The tiles come in a variety of nine different colors. The tiles are interconnecting and can be designed in multiple different shapes and sizes. There are 54 end pieces that can be attached around the outside to give the mat smooth edges. 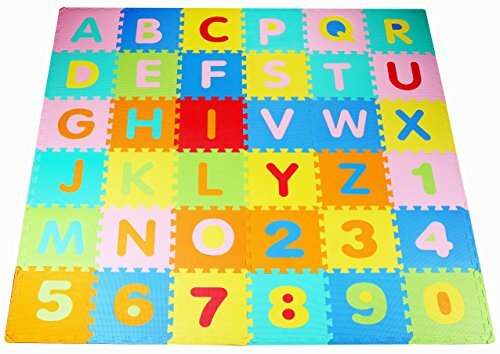 This foam mat contains a tile with each letter of the alphabet as well as the numbers 0-9. The foam numbers can be removed from the center of the tile. This can make these tiles so much more versatile. First and foremost, the tiles can create a play mat for your child. The interlocking design of the tiles allows you to create whichever size or shape of the mat that would best fit your child’s play area. You can use just four tiles to create a small sitting space or use all the tiles to cover an entire playroom floor. With the foam mat, your child can play and you do not need to worry about them falling over and bumping themselves. It is a safe and clean play area. You can use the tiles to cover any floor where your child may otherwise receive splinters from wood, or be cold from the tile. Or, you can cover floors that may not be the cleanest and you worry about your child picking up dust and eating it. The tiles are just hard enough that they can still easily drive their cars over the tiles and walk without falling while being soft enough to cushion them if they do happen to fall. The foam tiles can also be turned into play things. While the tiles can interconnect to create a mat, they can also interconnect to create cubes or other 3-D shapes. These shapes can either be created by your child to stimulate their creativity, or built by you. Your child can then use the blocks to stack or build fortresses. The numbers and letters can be removed and used as a teaching tool or as a fun toy for your child to play with as they become accustomed to the shapes of the different letters and numbers. The colors also provide a great opportunity for your child to learn the names of their primary colors. The mat is versatile as both a toy and a safety item. The mat is non-toxic and free from lead, BPA’s and Phthalates. It can be broken down to take with when you travel. The foam is a high-quality EVA that is also slip resistant. The foam tiles may not keep your child entertained as long as other toy options. There are lots of small pieces that could get lost. This toy requires assembly whether making a mat or building cubes. The Fisher-Price Chatter Telephone is a great way to get your little guy to start talking. Your son may consider is first smartphone as his first real phone, but you’ll know the truth that long before his touchscreen connection, he had this Fisher-Price phone attached to him at the hip. This phone is a toy that has been out for years. Many parents will remember a very similarly designed phone that they played with as children as well. That is because it is a good, sturdy design that has kept children entertained for decades. The phone has the look of the original dial phones. The receiver is connected by a short cord. It is then nestled on the top of the dock. The dock has a large, round dial. The dial is surrounded by many of the primary colors to help your little one learn their colors. It also has the numbers 0-9 to help with your child’s counting and number recognition. A friendly face on the front of the phone makes the toy more welcoming for your little one. The phone then sits on four sturdy wheels. Your little one can walk around the house and pull the phone behind him by a pull string. In this way, he will have this first portable cell phone. The phone is not merely entertainment. In this day and age, people can easily spend hours on their phone each day. Your little son will be watching you take countless calls and talk to family, work, and friends. Eventually, he’ll want to start mimicking you. Having a phone of his own will encourage your little one to start speaking and repeating words as he pretends to have his own conversations. You can purchase the phone in packs of 2,3, or 4 so that your son can engage in a group conversation with his friends. There are no detachable parts that can get lost. The phone cord is rather short as not to be a choking hazard, but makes the phone more difficult to use. There are not many activities that can be done with the phone to keep your child entertained for longer periods of time. 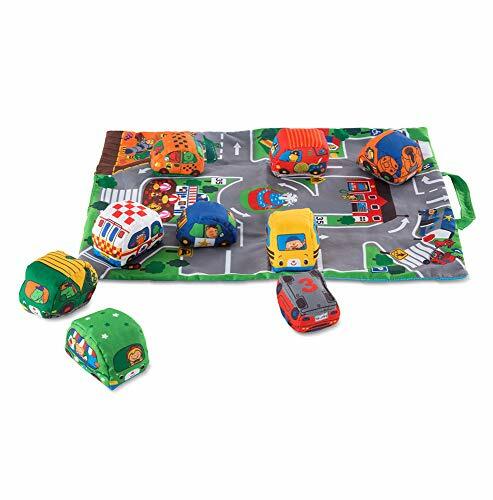 The Melissa and Doug Take-Along Town Play Mat could be your child’s first car set. The set includes a mat with a road along with vehicles. The vehicles are made from a soft material so you do not need to worry about your child hurting themselves on these cars. They can use them to drive around the mat as they learn to develop further motor skills. Eventually, your little boy will probably be wanting hot wheels and many of the other popular car brands with turning wheels and shiny chrome. When your son is just one-year-old, he has yet to learn all the basic safety rules when it comes to play. Regular vehicles can include small parts that can be easily broken and swallowed as well as sharp edges that could hurt your son. The vehicles in this set are a great first car set as they have no such risks. They are made safe for even the smallest infant to play with. The cars are not the only part of the set that is safe. The mat is also made from extra cushy material so it is soft on your little one’s knees. It is a smaller mat that is the perfect size for your little toddler, but also small enough to be rolled up easily and carried to different locations. In fact, the mat is made specifically with a carry handle so that it can become a tote inside which the cars can be stored. In this way, you can take the mat and cars wherever you go and lay the mat out when you travel so your child will always have a clean and safe playing area. The mat measures about 19.25 inches by 14.25 inches. The play set can help with your child’s motor skills and creativity as well as basic vocabulary. You can use the set to teach your child basic road safety and help them practice keeping their cars on the road. The road provides some fun driving options such as a roundabout, a bus stop, a crosswalk, and a few parking spaces. The map also has locations such as a firehouse, hospital, school, ice cream parlor, police station, and a construction site. The vehicles correspond to these locations as well as a few additional cars and careers such as a garbage truck and a taxi. The different cars make crinkling, squeaking, and rattling noises to make playing with them more exciting and interactive. Talking about the different places in the town and vehicles can help your child understand their own neighborhood and learn basic vocabulary. Your child can play with friends as there are plenty of vehicles for multiple children. This toy set is very easy to transport from place to place. There are no sharp edges or moving parts that can break easily. The mat helps your child learn new vocabulary. The mat provides a safe playing environment for your child. The vehicles make noises that can’t be turned off. There are many vehicles which could easily get lost or make a mess. The VTech Turn and Learn Driver is a fun way for your little one to pretend they are driving just like their mom and dad, but without them having to even leave the living room. 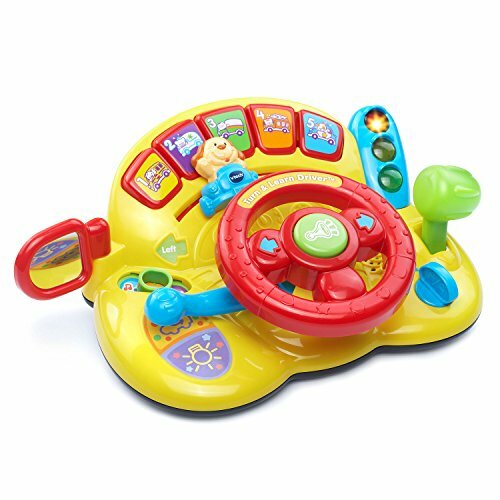 The driver is an interactive toy with lots of buttons, switches, levers, and lights to keep your child entertained for hours while pretending to drive their fine sports car. The toy operates on two AA batteries. It is available in two different colors: orange and yellow, so your son can have a personalized vehicle according to their taste. This driver toy is safe for children ages 6 months till two-years-old. This little driver provides both a fun and educational experience. The board is set up similarly to what you would find in a regular vehicle. The main part of the board is the large steering wheel. Your little one can turn it and pretend he is driving. There is a horn and two turn signals on either side of the steering wheel for an even more realistic driving game. There is a turn nob that visualizes the key to get the car started. A gear nob allows your child to shift up and down as they drive. A secondary nob is sticking out of the side of the steering wheel for even more sound options. There is one side mirror so your child can double check anyone who is coming up behind him. The other side of the board has a light. This will turn from yellow to red to green letting your child know when he can drive and when he should stop. All these items are connected to lights and sounds. The board also has an educational aspect. Your child will develop some fine motor skills through pulling, twisting, and spinning the various levers and other items. He will also learn some basic road rules such as turning, stopping, and always checking for safety. In front of the steering wheel, your child has a toy dog in a vehicle that he can move to represent his own drive. There are also buttons with the numbers one through five and some fun vehicle pictures as well as the primary colors. These buttons help teach your child basic numbers, colors, and vocabulary. This toy can keep your child entertained for hours. There are many educational activities involved with the toy. The toy helps develop many fine motor skills. This is a single child toy and is not easy to use in groups. The VTech Busy Learners Activity Cube is a smaller, beginner’s activity cube that will help introduce your little one to basic actions, vocabulary, and games. The smaller size also makes this activity cube easier to take with when traveling. In total, it has around 14 different features that can be moved, pressed, and played with to help develop multiple different fine motor skills. The cube requires two AAA batteries to function. The cube has five different sides filled with fun activities for your little one. These activities are simple enough that they can be used as early as six-months-old when your child first starts to sit up on their own. They can keep your child entertained up until they turn three-years-old. The smart cube has an automatic turn off when it has not been used in a while, and a motion sensor will automatically turn it back on when your child picks it up to play with. Each side of the activity cube focuses on a different aspect of your child’s development. One side has four light-up buttons. These buttons can be pressed to learn about different animals. The buttons will tell the animal name, sound, and even introduce basic shapes. Another side is musically themed. Three different instruments are featured which can be shaken, clapped, and hit to make the sounds of the corresponding instruments. Another side has four cubes with the first four letters of the alphabet. When the cubes are spun, a picture is shown starting with the featured letter. A slider allows your little one to move a ladybug up and down a path while listening to fun tunes. A basic flipper lets your child have fun twirling different shaped panels around a central pole. In total, the cube has 25 songs and tunes. The cube is easier to travel with. There are plenty of activities to do with the cube. The cube helps develop your child’s fine motor skills. There are many educational activities that teach vocabulary, letters, and shapes. The cube is designed for a single child and would be difficult to use with multiple children. There are many moving parts that are easier to break. 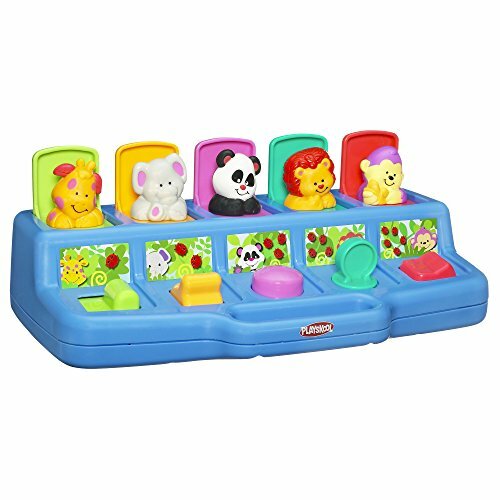 The Playskool Play Favorites Busy Poppin’ Pals is a classic toy that has stood the test of time as a staple in many families’ homes. The concept is so simple, yet fun enough to keep children entertained from generation to generation. The idea is that your child has to complete an activity in order to cause a door to pop open and expose a fun character. This specific pop-up toy is jungle themed. This pop-up toy from Playskool features five different pop-up doors. The doors include a giraffe, elephant, panda, lion, and monkey. Each animal also has their own unique color. Your child needs to complete each animal’s specific task in order for that animal to be exposed. The giraffe requires your child to slide a switch back and forth, the elephant is a switch that is moved up and down, the panda is a push button, the lion is a turnkey, and the monkey is a basic switch such as is used for a light switch. Each of these tasks requires your child to focus and use their fine motor skills. At this point, your son may be used to grabbing with his fist. This game teaches him to use his individual fingers to manipulate the letters and switches. The game also helps your child learn basic colors and shapes, as well as the names of the animals. The game is great for children ages 9 months and older. The toy helps develop your child’s fine motor skills. The toy can help introduce your child to basic animals, colors, and shapes. It is small enough that it can be taken with when traveling. There are no annoying or loud sounds that can limit the toy’s use. The toy is meant for one person and is not a social toy. The toy only has the one game, which can limit how long your child remains interested. The Fisher-Price Baby’s First Blocks is a set of plastic shapes that come in a box with coordinating shaped holes. This is another classic game that helps teach children their shapes as well as help them develop critical thinking and fine motor skills. This set is a small set that is perfect for smaller children who are just starting out in their learning journey. The smaller size also makes it easier to travel with. The bucket has a carry handle as well so you can take it from place to place with little effort. The box has a fun jungle design with pictures of lions and crocodiles on the front. There are ten shapes that all fit inside the carry box. The lid has five different shapes in it. You can use the colorful shapes to teach your child the names of the primary colors- red, purple, green, yellow, and orange- as well as teach them the name of the shapes. The shapes include a square, circle, triangle, star, and a cross. Your child can then practice identifying which shape can fit through which shaped hole and drop them in the box accordingly. They can also have fun stacking up the blocks to make colorful towers. This toy set is very easy to travel with. It has some great educational tools along with the toy set. No batteries are required to operate the toy set. Your child can learn shapes and colors. This toy will challenge your son’s critical thinking. The activities possible with this set are very limiting and may not keep your child entertained as long. This game is not as easy to play with multiple children. There are many parts that could get scattered or lost. 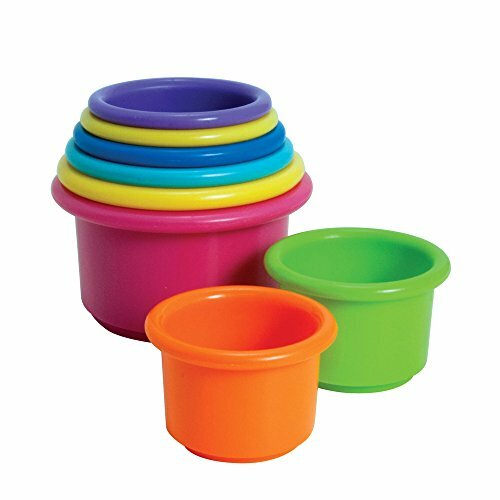 Since we have been bringing up many of the classic infant and toddler toys already, we have to mention the First Years Stack Up Cups. Most children have had at least one set of stacking cups at some point in their lives. It is such a simple game that has some great benefits for your child’s motor skills and educational learning. The First Years has taken the concept of stacking cups and made them even more educational. The set includes eight different cups. Each cup is different in size and color. You can use these cups to teach your child the names of the primary colors as well as terms like “small,” “medium,” and “large.” Each cup also has a large number embossed on the cup. Because the number is embossed and not a sticker, you do not need to worry about it wearing off over time and use. You can use these numbers to teach counting, number recognition, and basic math. Your child can also practice their fine motor skills and critical thinking as they learn how to stack the cups so they will not topple over. Small ridges on the top of each cup also help with stacking the cups. These cups are very affordable. They are small enough to throw in a purse and take with when traveling. The cups help teach your child basic counting skills and some vocabulary. Your child can have his critical thinking challenged. There are no batteries required to operate this toy. As it is a simpler toy, there is also a chance your child may grow bored easier. There are many parts to the toy so you could easily lose a cup, or have them scattered in a mess when playing. These are more difficult to play with as a group with other children. The ALPIKA POP-up Kids Playhouse with Tunnel and Ball Pit for Children’s Birthday Gift is a fun playground set-up toy that can easily be collapsed and stored between uses. If you have a child who has high energy, but nowhere to use the energy, this playhouse may be just the thing. It is comprised of two separate pieces. Together, they form a large train that your child can climb all through. This playhouse can be used either outside or inside a large room. The material is a sturdy polyester material stretched over memory wireframes. This makes it sturdy when it is opened up into a pop-up tent style playhouse. It can also be easily folded flat with a simple twist after which it can be placed in a small storage bag so that you can slide it between shelves for storage. There are two portions to the playhouse. The main portion of the playhouse is a large cube area. This area is designed to resemble the caboose. This caboose area is tall enough for a small child to stand up. It is designed to be used as a ball pit. You can fit around 100 plastic balls in the caboose section. The second part of the playhouse is the tunnel. It resembles the front of the train with wheels. Your child can crawl through this tunnel in order to get into the ball pit. This playhouse is a fun distraction to keep your child occupied at home, or to use when he has friends over. The large playhouse is a great way for your child to remain active and be able to socialize with others. The playhouse is able to hold a total of 3 young children. Younger children should not use the playhouse without parental supervision. The tent portion of the train is 31 inches square, while the tunnel portion of the train is 43 inches long and 19 inches high. This makes the total length of the train 74 inches long. Altogether it weighs about 1.3 pounds. This is a great way for your child to remain active. Multiple children can play together at one time. It is easy to store between uses. There are no batteries required for it to function. It is rather large when set up, so you will be limited as to where your child can play. You will need to purchase plastic balls in addition to the playhouse. There are not any overly educational portions of the toy. Now that your son is a little older, he may have started having favorite stuffed animals which he enjoys sleeping with. He may also just have a favorite stuffed animal that he carries around during the day. Stuffed animals have been children’s best friends for ages. Fisher-Price now offers an adorable puppy stuffed animal that can not only become your son’s best friend, but also his teacher. 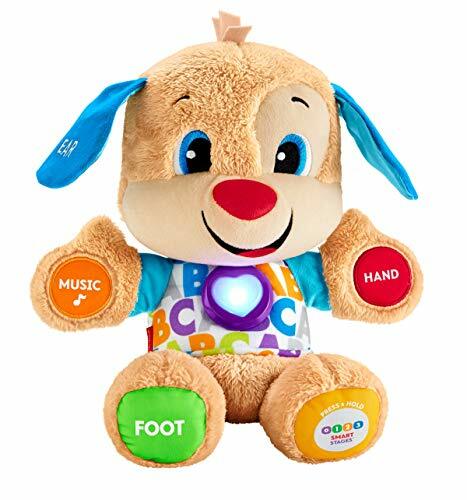 The Fisher-Price Laugh&Learn Smart Stages Puppy is designed to help teach your child their first words, fun songs, and keep your little one entertained and well-educated. The puppy is designed to grow along with your child. It has three learning stages to help teach your child on their level. In total, the puppy is able to teach 100 different words and phrases. These words include shapes, numbers, letters, body parts, and so many other basic words. 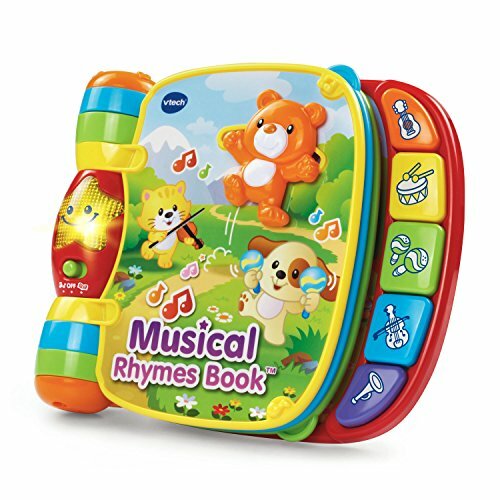 In addition, it has over 75 songs and sounds to keep your son singing, dancing, and moving. The puppy has multiple sensors and press buttons. You can press his ears, hands, and feet, all of which are labeled accordingly to help your child learn the names of the parts of your body. The puppy’s heart will light up when pressed. In total, there are five areas all over the puppy that can be pressed to hear sounds, words, or music. The puppy runs off of 3 AA batteries. The puppy is designed for children ages 6 months till three-years-old. The puppy is very educational and can keep your child very entertained for a long time. The puppy is fun to play with in the creative play. The puppy is easy to take with when traveling. The puppy requires batteries to function. It is not a social toy that can easily be played with by multiple children at one time. One of the earlier toys mentioned was a toolset that was part of an activity center. 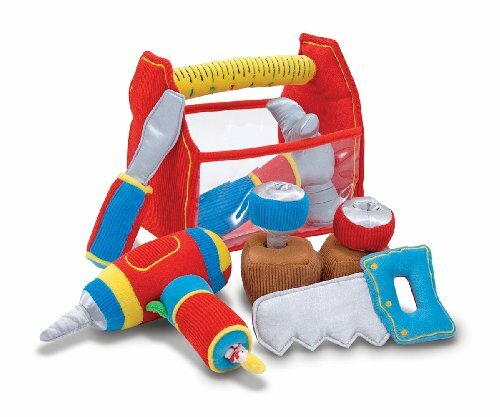 Now your little one also has the opportunity to have fun with a toolset on its own. This toolset is specially designed for younger children as it is made out of a soft fabric instead of plastic so your child will not hurt himself. 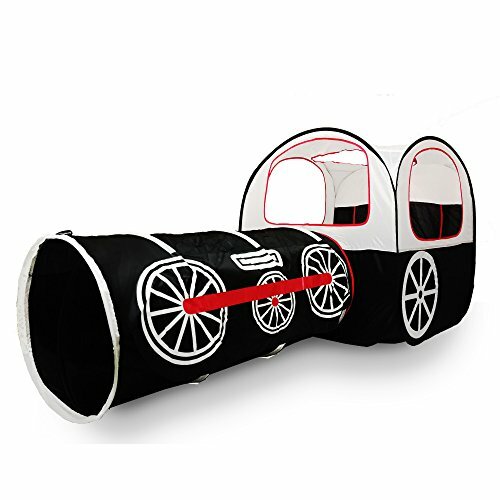 It is designed for children ages 18 months and older. Your little carpenter can help out around the house with his own little tool set. The set includes nine different pieces. The eight tools fit in a large, soft toolbox. The box has a sturdy handle that doubles as a measuring tape. The toolbox has a Philips head screwdriver, a saw, and a hammer. There are also two bolts and two washers for the bolts to screw into. A drill has the added fun feature of vibrating when using it to provide a more accurate feeling of drilling. The drill does not need a battery to function. Your child will just need to pull down on the bottom tab and it will provide the feeling of vibrating. The motions and actions of working with the toolset help to develop your child’s motor skills and imagination. All the tools are made from soft fabric. In this way, your little one will not scratch himself on any sharp edges or hurt himself in any way. It is also free of small parts that can easily be broken and swallowed. It is made from soft polyester fabric and child-safe materials. All the items are machine washable. There are multiple pieces so it can be used by a group of children in the community play. No batteries are required to operate the toy. The pieces all fit neatly in the travel container to easily transport. All the pieces are soft so there is less of a chance of breakage. The toys are machine washable. There is little educational value with the toolset. The tools may not entertain your child for long periods of time. Those who read have no limits to the places they could go in their imaginations and the real world. Reading opens up worlds and opportunities for your child. VTech has provided a great book to start your child’s library with. The book is very bright and colorful as well as having plenty of interactive tools to keep your child engaged. The book has six fun, interactive pages for your child to delve into. Each page is filled with flashing lights, songs, and words that help teach your child. The book covers colors, instruments, and nursery rhymes. In total, the book offers over 40 songs, sounds, and phrases that it can teach your child. Each of the pages includes a written rhyme or song that is great for pre-K reading. Until then, your child can listen to the poem being read to them. Down the side of the book are five different instrument buttons that allow your child to interact with the songs and rhymes of the book. The book requires 2 AAA batteries to function. The book is intended for children from 6 months till 3-years-old. The book is easy to transport and travel with. It helps teach your child valuable vocabulary and reading skills. Your child could develop an early love of reading. There are plenty of activities and actions to keep your child occupied for long periods of time. The book is designed for use by only one child at a time. The sounds of the book make it inconvenient to use during some occasions. The item does require batteries to function. 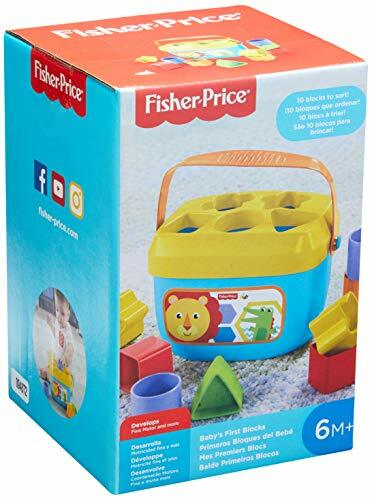 What better way to end this list of best toys for one-year-old boys than to bring up another good classic toy: the Fisher-Price Rock-a-Stack. When people talk about classic toys, at some point someone will think of the stacker. Many parents have even had these stackers of some brand or another during their childhood as well. The reason they have stayed around so long is that they are both educational and fun. 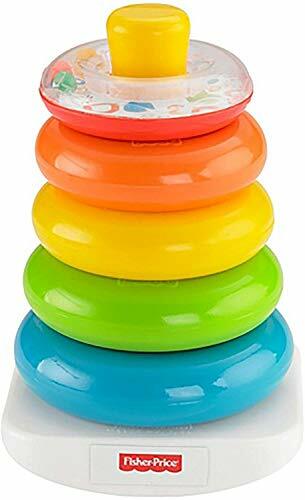 The Fisher-Price Rock-a-Stack consist of five hoops. Each hoop is a different primary color. The primary colors provide a great opportunity to teach your child the different colors. The top hoop has rattling beads inside for a fun twist. When all five hoops are stacked on the base, you can rock the stack back and forth. The stacker is a great tool for young children and babies. It helps teach your child critical thinking. They learn to recognize differing sizes. They can also reason out how the larger sizes go first followed by the smaller sizes. This comparison helps develop their mental skills. They will also need to use fine motor skills to learn how to match up the holes in the hoops with the base in order to properly stack the hoops. This toy is great for all children ages 6 months and older. Your child will have the challenge to help develop their problem-solving skills. The toy is small enough to take with when traveling. This is a very affordable toy. This toy is best if used by one child at a time. There are multiple pieces which could get lost. There are limited activities with the toy which could limit how long it holds your child’s interest.